The body of a teenage Kenyan girl, whose parents say she died after being raped by British soldiers, has been exhumed by forensic experts. The parents of Mantoi Kaunda, who was 16, say she and her sister were attacked after collecting firewood. The girls were at Archer's Post, in a remote central part of the country close to Mount Kenya. 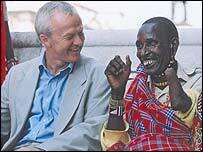 The UK has ordered an investigation into allegations by hundreds of Samburu and Masai women that they were raped. British Royal Military Police Special Investigations Branch and Kenyan police have been looking into 650 claims dating from the 1980s and 90s. Many of the women are being represented by London-based lawyer Martyn Day who has won £3.9m in compensation from Britain, for 230 nomadic herdsmen maimed by munitions left at training grounds. The exhumation was ordered in August after a request from the Kenyan Criminal Investigations Department. Twenty forensic experts from Kenya and the UK have travelled to the area, one of the ranges where British soldiers carried out exercises. Mantoi Kaunda's father was present at the exhumation. Her parents say she was six months pregnant when the attack is alleged to have taken place, and died later the same day. The body will be reburied after tests have been carried out. In a statement, the British High Commission said: "The Ministry of Defence takes these allegations extremely seriously and is determined to get to the truth. "This is an unparalleled investigation, in terms of size and scope, and is being conducted with permission and full assistance of authorities in Kenya. "The investigation is complicated by the length of time since some of the alleged incidents took place, the remoteness of the areas involved, and the volume of information gathered."